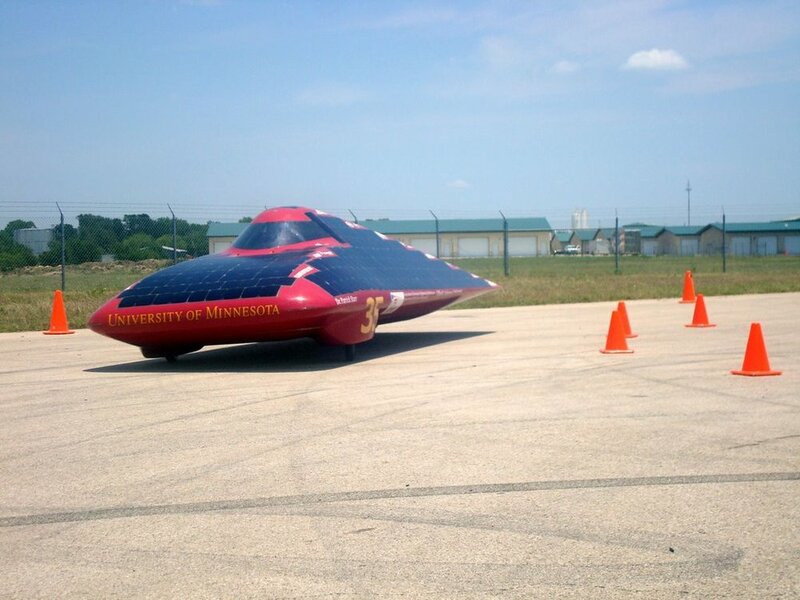 Today the University of Minnesota Solar Vehicle Project continued the tradition of being prepared for the scrutineering process by being the first team through a little after 4:00pm today, earning us the pole position on the starting grid when we get on the track on Wednesday. The entire process went very smoothly; the only major problem we had was with the rear vision test. After many hours of head scratching, the team finally figured out how to adjust the focus on the rear view camera and we passed easily. We're going take it easy tomorrow while the rest of the teams get inspected, and help out those who need it. Congratulations on scrutineering and good luck on the race! Great job, you have greatly reduced your old Sweed faculty advisors level of worry by many DB. Congrats on passing tech inspection first, yes help others generously, and drive safe! Wonderful, but no surprise! May the race go as well as the scrutineering. Are you eating well? Better than pbj, I hope. I wish I could be in Texas watching this! Thanks for blogging. Jeanne, what would a solar car race be without PB&J? We've branched out a bit (oatmeal, mashed potatoes, rice...) but you can't beat old staples. Adem, is this one of those "it builds character" things? You make me think of the dad in a Calvin & Hobbes cartoon. Seriously, I just want to come down there and grill some steaks for y'all. I suppose being poor college students, ramen noodles would be more appropriate.